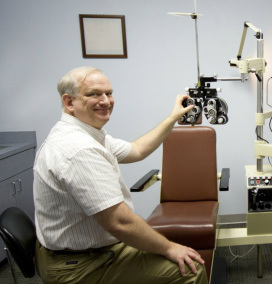 Dr. Bangstad graduated from The Ohio State College of Optometry in 1983. He and his wife have lived in Gainesville since 1987. He is patient and believes in getting the prescription right the first time. In his spare time, he enjoys playing pipe organ at church and keyboards in several local bands. to treat issues such as pink eye, scratched cornea, stuck contact, possible ocular migraine and others. Please call and we will work you into the schedule. ﻿﻿Gainesville Opticians cares about more than writing you an eyeglass prescription and helping you select a great pair of glasses. We work with you to understand your health history, visual needs, and solving any eye-related issues you may be having. The optometrist is at Gainesville Opticians Monday through Friday. Appointments can be made over the phone at 352-271-3338. Optometrists (ODs) examine, diagnose, treat, and manage diseases, injuries, and disorders of the visual system, the eye, and associated structures as well as identify related systemic conditions affecting the eye. Dr. Bangstad can prescribe ocular medications and assess the need for certain surgical procedures. He will takes into account your current correction *and* your feedback in the exam room in order to determine an accurate eyeglass prescription that you will feel comfortable wearing. For this reason, if you have not seen our doctor previously, we ask that you bring in a pair of glasses with your current prescription. For some reason, if you do not adapt to your new prescription, we will recheck the results, and make adjustments and remake your lenses if necessary, at no charge*. Some places charge extra to dilate your eyes…but with Dr. Bangstad, we think every eye exam should be a thorough eye exam, so the dilation is included in every eye exam. When the doctor dilates your eyes, it is like opening up a door and looking into a room. If the eye doctor does not dilate your eyes, it is like looking through a keyhole. You can imagine how difficult it is to see what is happening inside your eye without dilation! But rest assured, we can still perform an ocular health assessment, if you decline to have your peepers dilated. In addition, our eye doctor performs every eye test himself. At a majority of practices, technicians perform many of the tests with automated machines and the patient is with the doctor for 10 minutes. Our eye doctor spends 30-45 minutes with each patient. When the eye doctor is conducting all the tests, he is spending more time with you, getting to know you and your needs better, and detecting more changes. Periodic eye exams are an important part of routine preventive health care. Many eye and vision conditions have no obvious symptoms. Therefore, individuals are often unaware that a problem exists. Early diagnosis and treatment are important for maintaining good vision and when possible preventing permanent vision loss. The need for and frequency of optometric examinations vary with age, race, medical history, family history, occupation and other factors. In addition, the presence of certain risk factors may require more frequent evaluations based on the doctor’s judgment. Usually, eye exams are recommended every one to two years. It’s just like going to your primary care physician for a physical…but a whole lot more fun! In addition, we offer contact lens exams. Contact lens exam includes complete eye exam, spectacle exam as well as trial lenses and a return appointment to ensure proper fit at no charge. If you had a contact lens exam with Dr. Bangstad within the past year, and would like to re-order your contact lenses, feel free to give us a ring. If you would like to place an order online, click the button below. Advanced Retinal Scans Now available! For early detection of glaucoma, macular degeneration, and diabetic retinopathy. This high-tech instrument does 3D mapping of the retina for early detection of degenerative eye disorders​.